To be sure, the idea of a big, heavy revolver that can shoot a variety of big, heavy ammunition isn’t necessarily a new one. The early 1990s saw the Thunder 5 revolver from MIL., Inc. The Thunder 5 T-45 model was a hefty 9″ long revolver with an unloaded weight of 48 oz and was capable of firing .45 Colt ammunition as well as both 2.5″ and 3″ .410 shotshells from its rifled 2″ barrel. MIL additionally offered a similar T-70 model which fired .45/70 cartridges. Any of this sounding familiar? As best as we can tell, the Thunder 5 has been out of production since the late 1990s, although some are still floating around out there. Magnum Research also offers a model of their BFR (“Big Frame Revolver”) with a .45 Colt/.410 chambering. This heavyweight weighs in around 4.5 lbs (1.5 times the weight of the early Thunder 5 and about 2.5 times that of the newer offerings) and comes with a 7.5″ barrel, putting it in a slightly different class than the others. In all of these cases, the rifled barrel of the firearm in question prevents it from being deemed a short-barreled shotgun (SBS) under the 1934 National Firearms Act. However, it is our understanding that under California Penal Code 12020 the Judge is considered to be an SBS and is, generally, not available in that state. Presumably, the same holds true for the Governor. The two main differences (any perceived manufacturing and quality differences aside) between the two appears to be the increased capacity from five rounds with most Judge models and the addition of the ability of the Governor to fire .45ACP rounds by means of [full, half or third] moon clips. The Tritium front sight on the Governor might also be a handy feature if the user intends to point the revolver accurately. 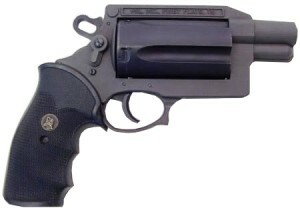 Due to the mechanics of the revolvers and their long, versatile cylinders, the .45 Colt rounds from either the Judge or the Governor and the .45ACP rounds from the Governor will not perform as well (either in a terminal ballistics or accuracy sense) from these firearms as they would had they been fired from a pistol chambered specifically for that round. For some more information about the performance of .410 and .45 Colt rounds from a Judge, check out Box O Truth #41 and Box O Truth #53. As far as a self-defense firearm goes (for preventing car-jackings, muggings, etc), it seems silly to lessen the performance and accuracy of a decent defensive round in order to gain the ability to shoot an even more poorly performing defensive round. As a rat or snake gun, I gather that this platform could be a very competent tool, I’m just not convinced that this is the best tool for self defense. It seems like it’s trying to fill too many roles and not excelling at any of them. 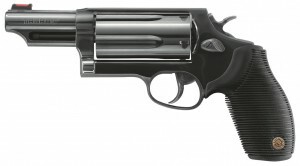 I recently purchased a Judge 2.5 cyc and 3 inch all steel blued.I like a bigger heaver gun as I carried a Colt Python 357 for many years on my job.The judge is a fun gun to shoot it has a good feel in hand and I am able to put the 45’s 80% in the 9 and 10 rings with a few bulls eye’s fireing 20 rounds.The 410 is of course for short range however at 30 feet they all hit the target.The 410 would be a good self defence for some one trying to jerk me out of my car or if i had to use it on an intruder in my home i wouldn’t have to worry of hitting the house next door through the wall. I really like it and don’t understand all the negitives about it.